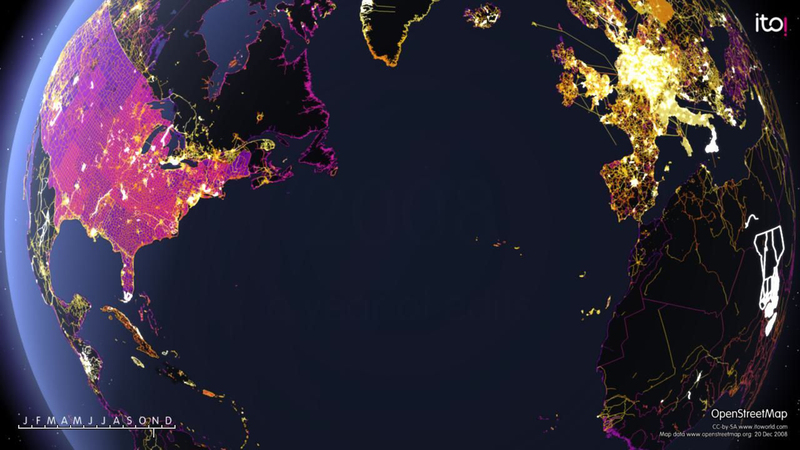 OpenStreetMap is a wiki-style map of the world. In this animation, each time a feature is entered or updated it flashes white and then decays through yellow and red to purple. Some edits are a result of a physical local survey by a contributor with a GPS unit and a notepa. Other edits are done remotely using aerial photography or out-of-copyright maps. Large areas of simultaneous edits are the result of bulk imports of official or donated commercial data. OpenStreetMap started in 2004, and the rate of contributions is accelerating. Four times more people contributed to the project in 2008 compared to 2007. During the year, edits were made by over 20,000 individuals, and there were bulk imports of data for many places, including the USA, India, Italy, and Belarus, which are clearly visible in the animation. The goal of this animation was to show how the OpenStreepMap community had become truly global from its roots in the United Kingdom. It was designed to celebrate the combined work of the community, most of whom are working on a much smaller scale.